Northern Michigan is a great place for young children to learn how to sail. 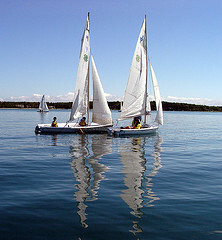 In Charlevoix, the Lake Charlevoix Mariners has been teaching kids how to sail for nearly 30 years. 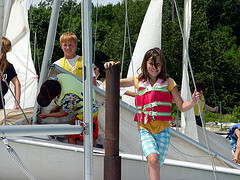 A 4-H program operated through the Michigan State University (MSU) Extension Service, the Mariners teaches sailing throughout the summer. children ages 8-19 how to rig a boat, knot tying, boat safety, basic racing, small boat handling, sail trim, docking and departing, and more. Students can register for morning or afternoon classes (or both). The eight-week program is a highlight of summer in Charlevoix and Boyne City for area and visiting children.